Please check my new page (Digital Evolution) on how web (technology) is evolving!! Past, Present & Future Outlook on digital technology. The future is a proces, not a destination. Disclaimer: this page will not be updated after May 1st, 2018. Do you know the answer to the next simple question? Experts call the Internet before 1999 “Read-Only” web. The average internet user’s role was limited to reading the information which was presented to him. The best examples of this 1.0 web era are millions of static websites which mushroomed during the dot-com boom (which eventually has led to the dotcom bubble). There was no active communication or information flow from consumer (of the information) to producer (of the information). But the information age was born! The lack of active interaction of common users with the web lead to the birth of Web 2.0. The year 1999 marked the beginning of a Read-Write-Publish era with notable contributions from LiveJournal (Launched in April, 1999) and Blogger (Launched in August, 1999). Now even a non-technical user can actively interact & contribute to the web using different blog platforms. If we stick to Berners-Lee’s method of describing it, […] the Web 2.0, or the “read-write” web has the […] ability to contribute content and interact with other web users. This interaction and contribution has dramatically changed the landscape of the web […]. It has even more potential that we have yet to see. […] The Web 2.0 appears to be a welcome response to a web users demand to be more involved in what information is available to them. This era empowered the common user with a few new concepts like Blogs, Social-Media & Video-Streaming. Publishing your content is only a few clicks away! Few remarkable developments of Web 2.0 are Twitter, YouTube, eZineArticles, Flickr and Facebook. There are many different views of Web 2.0 depending on who you talk to. This in turn leads us to the rumblings and mumblings we have begun to hear about Web 3.0[…]. By extending Tim Berners-Lee’s explanations, the Web 3.0 would be a “read-write-execute” web. However, this is difficult to envision in its abstract form, so let’s take a look at two things […]that will form the basis of the Web 3.0 — semantic markup and web services. Semantic markup refers to the communication gap between human web users and computerized applications. One of the largest organizational challenges of presenting information on the web was that web applications weren’t able to provide context to data, and, therefore, didn’t really understand what was relevant and what was not. [..]. While this is still evolving, this notion of formatting data to be understood by software agents leads to the “execute” portion of our definition, and provides a way to discuss web service. A web service is a software system designed to support computer-to-computer interaction over the Internet. […]. Currently, thousands of web services are available. However, in the context of Web 3.0, they take center stage. 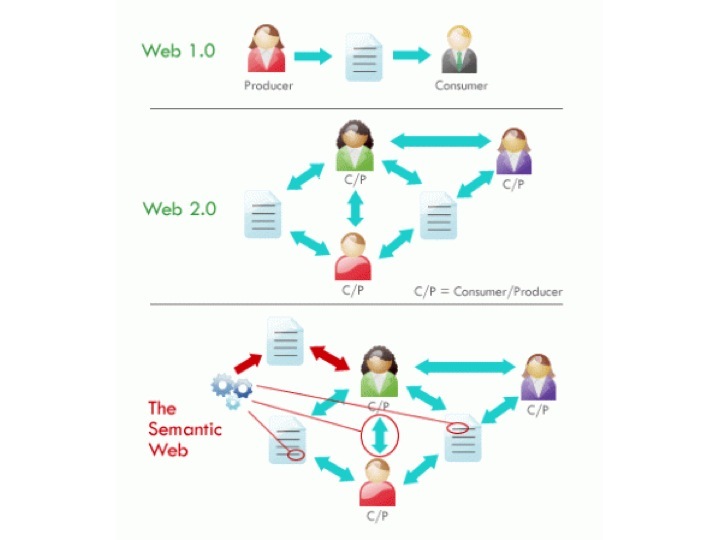 By combining a semantic markup and web services, the Web 3.0 promises the potential for applications that can speak to each other directly, and for broader searches for information through simpler interfaces. Web 3.0 – how, why and when. Kate Ray has made a good documentary on web 3.0, and explains realy why we need a semantic web and what the semantic web is all about. Because we aren’t there yet (completely), developers and users have come up with a ‘cheap’ intermediate way of contexualizing the search problem. You can read about it in my blog post: Can Google handle the Spam pressure? The next step is not realy a new version, but is a alternate version of what we already have. Web needed to adapt to it’s mobile surroundings. Web 4.0 connects all devices in the real and virtual world in real-time. Tim Berners-Lee gave an inspired TED talk in 2009 on this new Open en Linked Web. Although Web 4.0 5.0 still is in developing mode and the true shape is still forming, first signals are in that Web 4.0 5.0 will be about a linked web which communicates with us like we communicate with each other (like a personal assistant). Web 4.0 5.0 is called “symbiotic” web. This Web will be very powerful and fully executing. Web 4.0 5.0 will be the read-write-execution-concurrency web. Web 5.0 will be about the (emotional) interaction between humans and computers. The interaction will become a daily habit for a lot of people based on neurotechnology. For the moment web is “emotionally” neutral, which means web does not perceive the users feel and emotions. This will change with web 5.0 – emotional web. One example of this is www.wefeelfine.org, which maps emotions of people. With headphones on, users will interact with content that interacts with their emotions or changes in facial recognition. very helpful article explaining the difference. thanks! is just, and only just, a marketing name…. Same for me, thanks for the good videos! It`s really shocking how less the so called “digital natives” know about web 2.0 and the different web types. Why would they want to? Only has value for old historians. @ Frank, “digital natives” don’t know how was life before internet. They can not imagine a world without networks, connections all over the word, social media and access to media so easily. Is it possible to talk about any company that right now is operating with the Web 4.0 concept? PS. The way through the evolution of the web was quite interesting. It is nice to being able to identify and describe this digital world we are part of! I also think that to “digital natives” social media and smartphones, pads etc. is just normal life. Children learn with iPads nowadays! Keeping in contact with others all over the world has not been easier ever. For me as well is hard to remember the time when you had to just go knock on friends doors if you wanted to meet them. “Digital natives” has to be educated in using social media and smartphones etc. There isn’t another way to protect them. It doesn’t make sense to block them. What do you think? I totally agree on that! Without education digital natives will end up lost in the social media world which is growing faster and faster. The point protection you mentioned is a very important one. Only few days ago I read an article about cyber-mobbing on Facebook. Tragic that social media can end up in suicide when no one takes care…. Wave of information isn’t under control anymore. Be smart in the web! Again, I totally agree on your comment Claudia! Be aware of the fact that was is online or posted once, will stay online!! Very good page here. Very interesting that youngsters don’t know the expression WEB 2.0! Shows how normal it is – they don’t have to name it! All about fast web – miss slow web on these pages! Would be a good contrast – and leads to think! What is your opinion? Customized search would be great! All the data connection upsets me. Are we already transparent to 100%?! Probably we are but we don’t know! Where will this evolution end up? web 100.0? Amazon is a perfect example of web 3.0 I think. I never heard anyone complaining about Amazon and its services… pretty good business model! Thank you as well for this interesting summary, I am sure it will be very useful for me in the future. Especially about Web 4.0, I will definitely be following from now on how this will progress in the future. Just wanted you to know that I used the videos in this post for a William Paterson University professional development session on creating a virtual footprint. I’ve credited your organization and provided a link to this post. If you’d like me to remove anything, please let me know. Your post is the best I’ve seen at explaining the evolution of the web. I forgot to give you the link to the site I’m working on…visit it at: http://creatingyourvirtualfootprint.wordpress.com/ – your videos are on the Evolution of the Web page. Thank you! I have no problem with The usage of my materials. Very useful information with exact way. Thank you all. 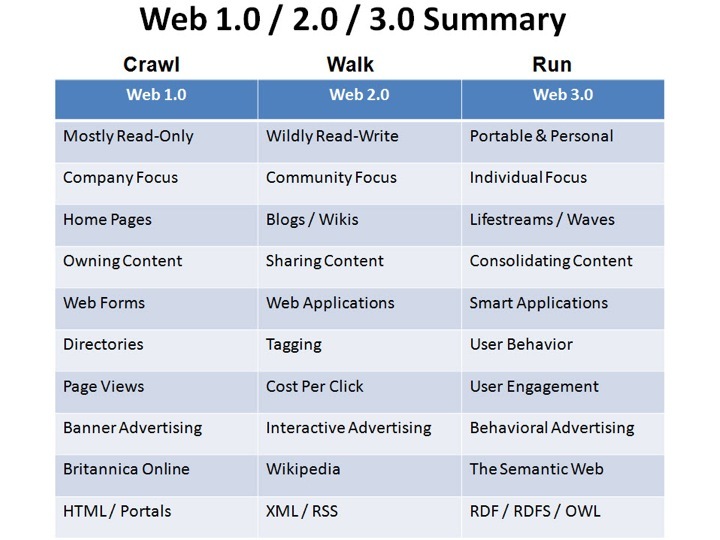 Really informative one.. when will you write about web 5.0? Excelente información, muy educativa, realmente ayuda a comprender la evolución del Internet. Gracias por compartirlo. Great information! Appropriate multi-media links. When did you publish this text? Sorry but I can’t find it. Hello Tina, The first publication was on November 25th, 2010 and updated regularly up until today. Technology on its own invention is now advanced and it simply authenticate u to use Iris scanner,swiping with finger ,sensory and emotive web .in most coming time on 7nth grade web 5 will undoubtely be more user – friendly than its predecessors. Yea and one day you’ll BEE a computer!! Yay!! I posted in 2013 a proposal on my blog to divide the Web Timeline in nine epochs. (http://www.web3.lu/divide-the-web-timeline-in-nine-epochs/). I think this contribution is still worthwhile reading. But I miss the mobile web! Mobile web, from my experience, needs be a different episode or add-on since it’s got specific features which traditional web does not have. I wrote in the Web 2.5 chapter (responsive web) that this epoch refers to the emergence of tablets and mobile devices. But you are right! My timeline graphic doesn’t reflect the specificity of the mobile web. I have some ideas how to improve that. I will explore these ideas more in depth in the coming days and come back with an enhanced proposal. P.S. Sure I would be glad if you add my post to your hyperlinks.